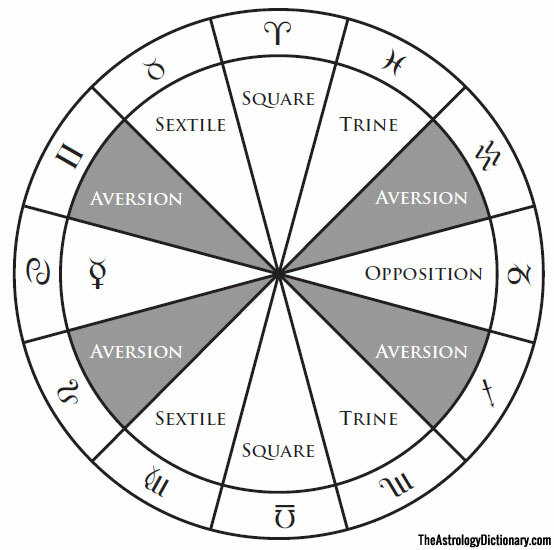 Two planets are said to be in aversion when they are in signs that are not configured to each other by any of the five Ptolemaic aspects (conjunction, sextile, square, trine, opposition). For example, if Mercury is in Cancer and Mars is in Aquarius, then the two planets would be in aversion to each other, since there is no major sign-based aspect between the signs that each planet is in. The concept of aversion is partially based on the notion that there is a lack of affinity between the signs that the two planets are placed in. Such affinities normally take place through the three major qualities associated with the signs: quadruplicity, triplicity, and gender. Signs that are configured share at least one of these qualities, whereas signs that are in aversion share none of these qualities, and thus they are alienated from one another. 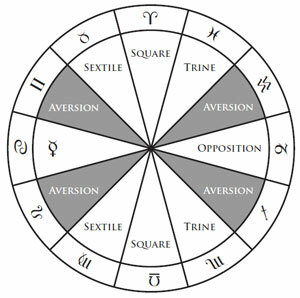 The concept of aversion is primarily used within the context of a sign-based aspect doctrine in Hellenistic astrology.